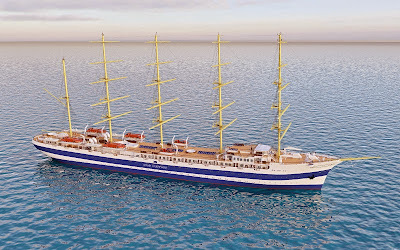 Tall ship sailing specialist Star Clippers has announced that it has started building a fourth ship to add to its fleet of graceful square-riggers; its first new-build since the launch of Royal Clipper in July 2000. The new vessel, yet to be named, will be the biggest and most ambitious to date and will be launched in the second half of 2017, carrying 300 passengers, measuring 8,770 tons and powered by more than 6,350 sq m of sails. The new ship will technically be a five-masted, square-rigged barque. While the company’s flagship Royal Clipper is modelled on the legendary German sailing ship Preussen, the new member of the fleet will be a near-replica of the even more dramatic France II, commissioned in 1911 and the largest square rigger ever built. 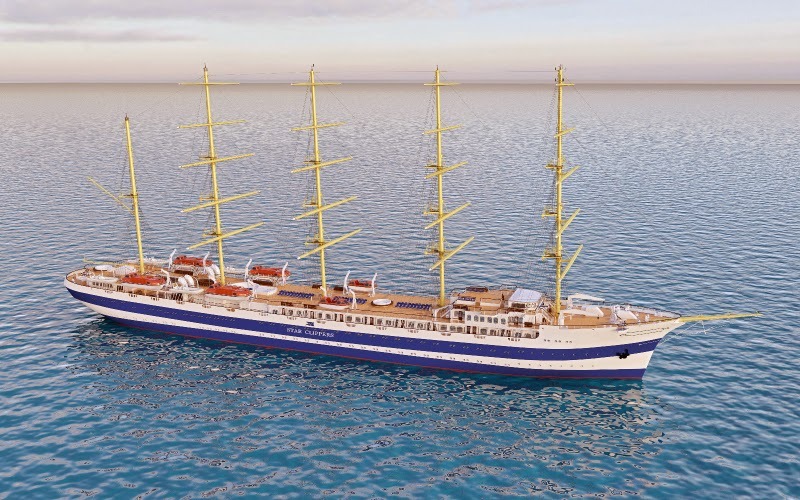 Just as the original France II eclipsed Preussen more than a century ago as the world’s largest square rigger, the Star Clippers new build will replace its sister, Royal Clipper, as the largest ship of its kind afloat today. As well as the generous deck space only found on a sailing ship, the new vessel will have three pools, one that funnels sunlight through the ship’s atrium into the elegantly appointed dining room. There will be a watersports platform in the stern for use when the ship is at anchor and a variety of cabin grades, including 34 suites with balconies and four luxurious owner’s suites. A restaurant in the light-filled atrium will accommodate all passengers for open-seating dining. Regular guests will be delighted to discover their favourite hallmarks of all Star Clippers ships, such as the cosy library, the bowsprit net and the popular, al fresco Tropical Bar, where evening entertainment takes place. While the ship will have ecologically sound, high-tech engines, it will, like its sisters, rely on wind power and its sails wherever possible. The new ship will be delivered in the second half of 2017 and will initially sail the company’s most popular itineraries in the Mediterranean and the Caribbean. Sales are expected to open in 2016. Cabins: 150 cabins including 34 suites with balconies plus four owner’s cabins. The two smaller ships, Star Flyer and Star Clipper, take 170 passengers each, with a crew of 74, while Royal Clipper carries 227 with a crew of 106. Star Clippers was founded in 1989 by Swedish entrepreneur and classic boat connoisseur, Mikael Krafft, initially operating two identical four-masted barquentines, Star Flyer, which set sail in 1991 and her twin, Star Clipper, launched in 1992. At 115.5 m long, with 3.365 m² of sails apiece, and carrying up to 170 passengers and 74 crew, both are modern, high-tech, re-creations of the classic clipper sailing ships that dominated the oceans of the world in the 19th century. The vessels were the first sailing clippers to be built since 1910 and heralded a renaissance of a golden age of sail. In 2000, Krafft added a third vessel, Royal Clipper, a fully square-rigged vessel with 42 sails. Royal Clipper holds the Guinness World Record as being the biggest five-masted ship in the world. Born in Stockholm, Sweden, on January 13, 1946, Mikael Krafft, the owner of Star Clippers, grew up in the port of Saltsjobaden in the archipelago adjacent to Stockholm. His area was home to one of the finest yacht builders in the world, the Plyms Shipyard. His first job was carrying varnish and mixing wood stain for the old-timers at the yard who would tell him tales of the great sailing ships that once dominated the high seas. Those stories often included the records set for speed and beauty by Pommern, a four-masted steel barquentine, anchored as a national historical museum at the Swedish-Finnish Island of Aland, in the surrounding Baltic archipelago. By the time Krafft was 10, his father had given him an 18-foot (5.5m) wooden sailboat and his lifelong fascination with sailing was underway. It was only a matter of time until he started sailing his boat across the open seas to Aland, without a compass. The island was 20 miles away, halfway to Finland. The towering masts of Pommern waited for him at crossing's end, guarded by museum watchmen, at Mariehamn. The guards were not swift enough to stop a determined young sailor from climbing her rigging. He returned again and again, learning every foot of the great ship. Krafft graduated from the University of Stockholm with a degree in Maritime law and studied further in France. He practiced law in both France and Sweden. In the late 1970s, he became the Managing Owner of a small Swedish shipping company, the L. Jeansson Company, founded in 1875. This company purchased the Ragne Shipping Company as well as the ship brokering company Scandocean. In 1986, Mikael Krafft sold his interests in Sweden. He, his wife, Ann, and their two children, Eric and Marie, moved for a time to Brussels. He founded the White Star Group of Belgium, which was mainly involved in major real estate developments within the Benelux countries. Since the early days, Krafft has been a passionate sailor. As his business interests developed, he also took the opportunity to become the owner of one beautiful sailing ship after another, each built by Swan of Finland and usually modified to his ideas. The yacht he built was a total custom vessel, delivered in 1986. This was the 128-foot staysail schooner Gloria. He also launched Doriana in 2005, a magnificent, 39-metre schooner, lovingly restored under Krafft’s watchful eye. The idea to form Star Clippers came during a leisurely Caribbean cruise, while anchored one sunset off St Martin in 1987 aboard Gloria. Suddenly, as Krafft recalls, "All the pieces came together." His long nourished clipper ship dream fell into place: he would build not one but two, and thus have a viable business proposition, a real cruise line. He knew in his heart passengers would rally to the concept of comfortable sailing on traditional major clipper ships, built to uncompromising yacht safety and appearance standards. Three years of intense research followed, some of it studying carefully preserved original plans for ships of the mid-19th century. There were mountains of design modifications to make because of the availability of materials not existent long ago, and scores of engineering innovations. Construction started in 1990 at a fine Belgium shipyard, the Belgium Shipbuilders Corporation Yard at Ghent. The result was 360-feet (115.5m) Star Flyer, commissioned in May 1991, followed a year later by her identical twin, Star Clipper. “Star Flyer and Star Clipper are actually much bigger than most clipper ships were,” says Krafft. “Technically, they are rigged barquentines, with a full mast square rigged and the remaining masts rigged for and aft. 2015 sees plans afoot to build a fourth ship, modelled on the tall ship France II. Krafft continues to run Star Clippers, alongside his daughter, Marie; his son, Eric. His wife, Ann, is also instrumental in the company. Star Clippers’ headquarters are in Monaco.